Clint Bowyer took the checkered flag in the caution-filled race, followed closely by Jeff Burton. Dave Blaney, Brad Keselowski and Brian Vickers rounded out the top five. Hamlin’s Joe Gibbs Racing teammates Joey Logano and Kyle Busch finished 24th and 33rd, respectively. By lap 25 of 188 the FedEx team was down a lap when a caution flag came out giving Hamlin the Lucky Dog to get back on the lead lap. After the green flag dropped three laps later, Hamlin weaved through the field, searching out various drafting partners to stay on the lead lap. By lap 42, Hamlin was running 31st and in a line of cars drafting similar to the old style of racing at Talladega. Lap 68 brought the second caution flag of the day as Logano’s left front tire shredded, tearing up the wheel well. Crew Chief Mike Ford brought the FedEx car to pit for left side tires and fuel, and the goal of connecting with the #18 of Kyle Busch. Busch had been drafting with Logano prior to the caution. Now with a secure drafting partner, Hamlin pushed the #18 car to first place by lap 91. As is often the case at Talladega, Hamlin soon lost his drafting partner when a caution slowed the field on lap 104. When the green flag dropped, Hamlin was once again searching for a collaborator and fell to the back half of the field. Caution flag number five on lap 121 brought a welcome opportunity to radio for a drafting partner. Fortunately for the FedEx team, the #42 of Juan Pablo Montoya was also in need. The green flag dropped on lap 125 with Montoya pushing the FedEx car. However, caution flag number six quickly followed and the team was finally able to go to the original game plan and connect with Newman. Hamlin got in front of Newman’s #39 car with 50 laps remaining. Newman had sustained damage to his car earlier in the race and was not able to propel Hamlin to the front of the pack. By lap 148, the pair was running 29th and 30th. Yellow flag number seven on lap 163 brought the FedEx car to pit lane for four tires and fuel. This time, the FedEx team was able to hook up with Logano on the green flag. 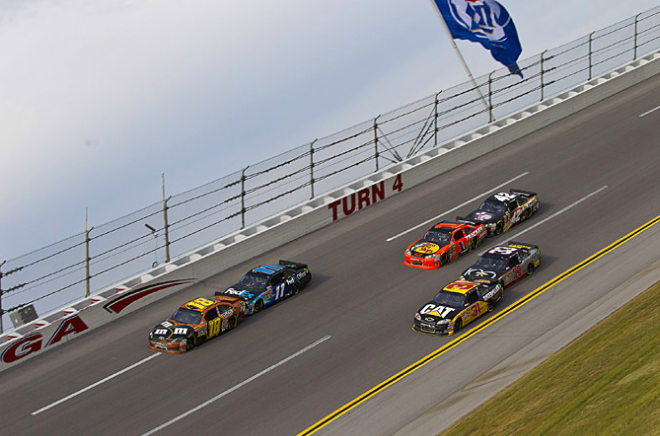 Being pushed by the #20 car, Hamlin surged up the field to 13th place. With eight laps remaining, Hamlin got wrapped up with Mark Martin and slid off of the race track. The ensuing caution brought Hamlin to the pits, where quick work by the FedEx team got the car back out on the track. Despite not having a set drafting partner, Hamlin was able to work up the field when the green flag dropped with three laps to go and claim a top-ten finish.